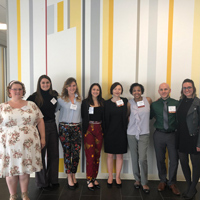 Eight Webster students presented and four faculty members served as judges at STLAURS 2018. On Saturday, April 21, 2018, eight students representing different disciplines across the College of Arts and Sciences from Webster University presented their research projects at the annual St. Louis Area Undergraduate Research Symposium (STLAURS). STLAURS is an inter-university and interdisciplinary initiative that encourages and promotes undergraduate research at universities in the St. Louis area. This year, participating universities included the St. Louis College of Pharmacy, University of Missouri-St. Louis, St. Louis University, Washington University of St. Louis, and Webster University. In addition to the eight Webster students who presented their research, four faculty members (Ravin Kodikara, Biological Sciences; Julie Setele, Anthropology and Sociology; Eric Rhiney, Management Department in the Walker School; and Elsa Fan, Anthropology and Sociology) served as judges. Special thanks go to the three Webster student volunteers (Madison Smith, Jackson Frazier, Olivia Potter) who assisted with the planning, organization and coordination of this wonderful event. Congratulations to all the students who participated and represented Webster at this conference. For more information about this event, visit www.stlaurs.org.